This collection of wine-inspired quotations will encourage some satisfying sipping. "Wine is sunlight, held together by water." Galileo's poetic tribute to the wonders of wine joins a host of literary quotations showcased on bottles, goblets, and lush bunches of grapes. The style and shape of the vessels reflect the era in which each wine-loving author wrote their vintage lines: An Elizabethan chalice holds verse from Shakespeare, while a slender, stemmed glass is inscribed with words by Baudelaire. Reading the romantic ways the ancient beverage has inspired us through the centuries is sure to inspire some satisfying sipping. Designed by Tim and Aurelia Sanders in Madison, Wisconsin. As soon as I saw this I knew Ihad to get it for my daughter. We share a love of wine and books. She loved it, she's in the process of picking her frame for it now. It's really fun to read the quotes and I think it will be a great conversation piece when she entertains. The colors are also very pretty and I can't wait to see it framed. 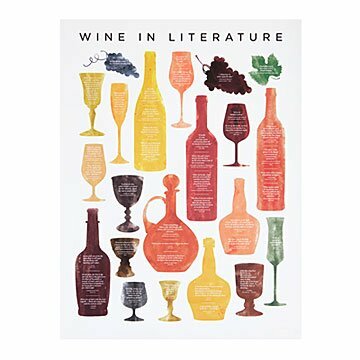 My son and his partner are getting an apartment and this poster combines his love and extensive knowledge of wine and literature. It was a hit!